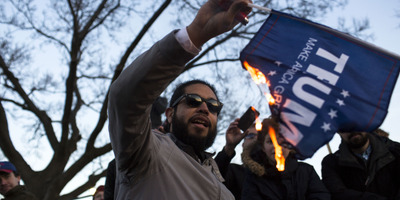 Jonathan Gibby/Getty ImagesA protester burns a flag ahead of a Donald Trump campaign rally in March 2016. 80% of Americans think that political correctness is a problem, a new study has found. A majority of Americans in all race and age categories felt this way, despite stereotypes and assumptions in society, it said. The study found that most Americans are part of an “exhausted majority” that are flexible in their political views. “America’s political landscape is much more complicated than the binary split between liberals and conservatives often depicted in the national conversation,” the study said. Most Americans dislike the culture of political correctness despite pervasive stereotypes based on age and race and the general understanding of deeply decided society, a new study has found. A report published Wednesday by More in Common, an organisation looking to reduce polarization and social division in communities, found that 80% of the US public believe that political correctness is a problem. It found that even young people are uncomfortable with it, including 74% of people aged 24-29 and 79% per cent of those under 24 – meaning those who don’t see it as a problem are in the minority across all ages. And it found that a majority of people of all races dislike political correctness. 79% of whites saw political correctness as a problem compared to 82% of Asians, 87% of Hispanics, and 88% of American Indians. African Americans are most likely to support political correctness, with 75% seeing it as a problem. Overall, the group found that the “us vs. them” narrative of two warring communities in American society was misleading – and that two-thirds of American’s are flexible in their viewpoints and tried of polarised national conversation. “Political polls and years of knife-edge elections have convinced many that our country has become a 50:50 society, divided into two opposing political tribes and trapped in a spiral of conflict and division,” the report said. Instead, the report found seven different segments of Americans based on the questions those surveyed were asked. More in Common defined these segments as: Progressive Activists, Traditional Liberals, Passive Liberals, Politically Disengaged, Moderates, Traditional Converatives, and Devoted Conservatives. Just 6% of Americans are devoted conservatives and 8% are progressive activists, the group found. It looked at a nationally representative poll with 8,000 respondents, conducted 30 one-hour interviews, and held six focus groups between December 2017 to September 2018. People in each segment had strikingly similar views on topics like immigration, sexual harassment, white privilege, Islamophobia, police brutality, and feminism, the study found. But it does note that those on either end of the spectrum are moving further apart.